Murray Rothbard traces economic ideas from ancient sources to show that laissez-faire liberalism and economic thought itself began with the scholastics and early Roman, Greek, and canon law. He celebrates Aristotle and Democritus, for example, but loathes Plato and Diogenes. This set is a monument to Rothbard's genius, a resource that will be valuable to intellectuals for generations, and a great read too! Rothbard rejects the Whig view, according to which the history of economics is a story of constant progress. To the contrary, he sees economics as a battle between two conflicting schools of thought. The correct one explains prices through subjective value: this approach culminates in the Austrian School. The other view explains prices by cost, especially labor cost. In the first volume, Rothbard stresses the great contributions of the Spanish Scholastics to the subjective tradition. Other great subjectivists included Turgot and Cantillon. Unfortunately, Adam Smith’s labor cost theories became the dominant view, especially in Britain. Rothbard regards Smith as largely a retrograde influence on economic theory. The second volume contains a brilliant critique of Ricardian economics, showing the constraints on theory entailed by Ricardo’s static and pseudo-mathematical method. Ricardo’s successor John Stuart Mill is the object of a devastating intellectual portrait. Marxism is subjected to a merciless demolition, and Rothbard shows the roots of this system in metaphysical speculation. The French classical liberals such as Bastiat, on the other hand, contributed to the subjectivist school. A further highlight of this volume is a discussion of the bullionist controversy: the views of the Banking and Currency Schools receive extensive analysis. I often find myself needing much more context when I am learning about a subject. How can I know what the controversies and debates are if I have no understanding of the history of that time? Imagine living int he 22nd century and learning about Ron Paul and Hoppe etc but not knowing what the debates were! Rothbard does such a phenomenal job on tying history, debate, perspective, and detail all into two volumes. Very importantly, do not forget to get the CD of 6 of Rothbard's speeches. He died before he could complete volume 3, so the LvMI finished it with Rothbard's speeches covering the material he would have written on. Rothbard really outdid himself with this work. This book is in-depth and covers the majority of the actors who advanced economic thought throughout history; not just the main figures that other authors focus on. If someone advanced the free market, Rothbard credited them; if they were responsible for the restriction of the advancement of economic thought, Rothbard took them on [regardless of religion, culture, etc.]. While the cost may seem steep, this book is worth it for what you are getting: the most complete economic history on the market [and from the Austrian point of view to boot]. This is one of Rothbard's best historical analysis of economic thought going back through history. If you want a deep and firm foundation on economic thought and how we got the main economic ideas of today, this two volume set is what you are seeking. 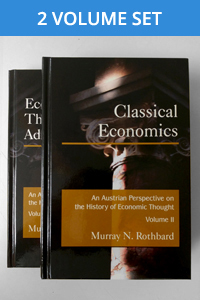 The appearance of the famous (and massive) volumes of Rothbard's History of Economic Thought in a new edition is cause for great celebration. The great French liberal of the 18th century, not only a proto-Austrian but also a fantastic defender of human liberty in every respect.